Hampshire windows turn American style! American shutters are becoming increasingly popular in the UK, actually the term American shutters is a bit of a misnomer. Shutters across the world have gone though a dramatic transformation since their origin in ancient Greece – although the Greek shutters were traditionally made from marble and the slats didn’t move. It was a revelation to have something at openings in ancient buildings to prevent dust and debris from getting inside. The American shutters we think of today are manufactured most often in wood and have slats which open and close. This customer’s American shutters in Andover, Hampshire only go halfway up the window and have 89mm slats to let lots of light in yet still retain privacy. These are called café style shutters. 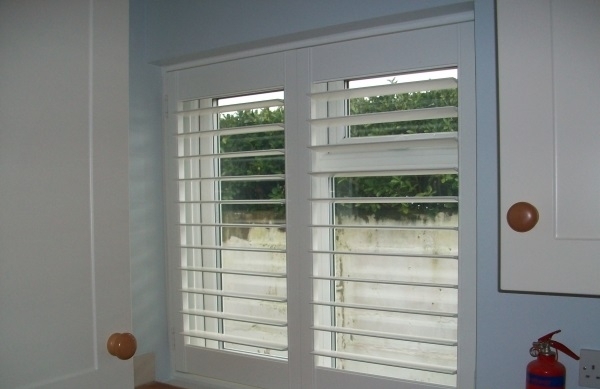 American shutters we see in TV shows often have a rod on the front of the shutter panels to open and close the slats with, At Shutterly Fabulous you can choose to have a rod on the front of the panel if you like – or not. The “no rod” option is called Open Sky. Read more about our shapes and styles here. Our Andover customer wanted to have American style shutters but really didn’t want to add any detail to the panels. They felt that their kitchen had simple, almost rustic furnishings and wanted their shutters to have that same kind of feel. They chose a bright white so their shutters look neutral and their furnishings can accent the room, choosing large slats or louvers on their shutter panels give a clutter free feel, as does the open sky push rod system which they have chosen. This style of window treatments is really becoming so popular in the UK, they are definitely a statement piece in any home and they really are functional, more so than heavy drapes or curtains as you can choose how much light you want to enter the room you have the shutters in, by simply opening or closing the slats. Contact Shutterly Fabulous for a ballpark quote to see how much this style of window shutter would cost to have in your home. Provide approximate heights and widths and Shutterly Fabulous can give you a quick ballpark quote over the phone or via email.